Did you know that all quarters from 1964 on back were made of silver? Yep – but none of the newer quarters (1965 to the present) are silver. Silver quarters are worth about 10 times face value — because silver is up right now. In 1931 it was decided that a 1-year commemorative half dollar coin should be made in 1932 — in honor of the 200th anniversary of the birth of George Washington. The front of the coin would be a design of Washington, and a contest would be held to come up with a design for the reverse of the coin. The contest was held before the approval of Congress was given to go forward with the new commemorative coin. The winner was Laura Gardin Fraser, the wife of James E. Fraser who was the designer of the Buffalo nickel. Congress decided to change things a little. 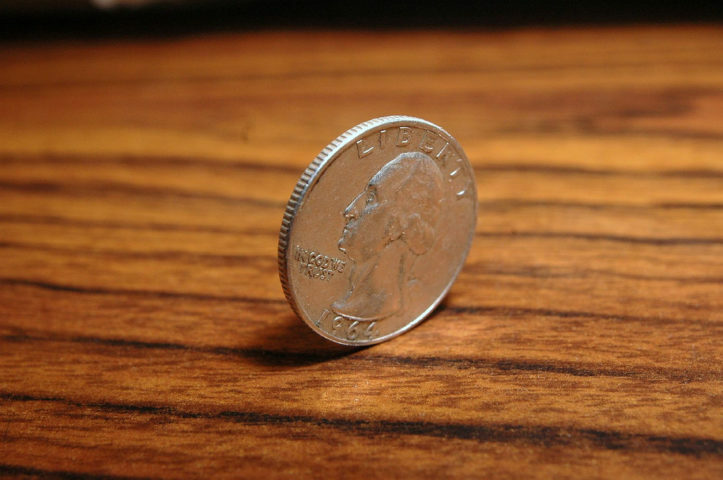 Instead of a half dollar commemorative, Congress decided that it was time to change the design of the U.S. quarter (which was the standing liberty quarter at the time) and that a portrait of Washington would be the design for the front of the new quarter. After Congress authorized the new quarter, the Treasury Department initiated another contest. It was strongly recommended to Treasury Secretary Andrew Mellon that Fraser’s design from the previous contest be adopted for the new quarter. Mellon refused, and proceeded with the competition. More than 100 entries were submitted on October 27, 1931. Among all of these, Fraser’s design (modified to fit on a quarter) was also submitted again. Once again, the artwork of Laura Fraser was favored, but Secretary Mellon preferred the design of a man named John Flanagan. It was argued over for several months and before it was settled, Mellon left the department to pursue his career elsewhere. The man to replace him was Ogden Mills, who then ended the debate. He stated that he was sticking with the decision of his predecessor and the design of John Flannigan was to be selected. The new Washington quarter was officially released on August 1, 1932 and has been with us ever since. As for Laura Gardin Fraser — who many felt was the most deserving in 1932 — she belatedly received a great honor. In 1999, 33 years after her death, her Washington design was selected to grace the commemorative half eagle ($5 gold coin) observing the 200th anniversary of the death of our first president. So I’m guessing that if you’ve taken the time to read the article this far you’d like to see what Laura Fraser’s design looked like? Here is Laura Fraser’s design on the Washington commemorative half eagle coin. Now that we’ve covered the lengthy history of the Washington quarter, let’s talk about the value. All circulated quarters from 1965 to the present date are only worth 25 cents — with one exception. Silver clad bicentennial quarters are worth about $4 in mint state condition. Now don’t confuse these valuable bicentennial quarters with the bicentennial coins you find in your change. Those are not silver clad issues. The silver clad issues were only made for sale to collectors in Mint sets and Proof sets — not for circulation. So, the value of non-clad bicentennial quarters is 25 cents. There were several hundred million minted and they are still commonly found in pocket change. It’s interesting though that the “drummer boy” on the reverse was also chosen by holding a contest. The winning design was submitted by Jack L. Ahr. The dual-dated coin was struck in 1975 and 1976. Here’s what the bicentennial quarter for circulation looks like. If you’ve read any of my other articles, then you know that prior to 1965 coins were made out of 90% silver. That being said, most quarters from 1964 to 1936 are worth about $3 to $8, depending on the grade — because they’re silver quarters. Most coin shops will only buy silver quarters of these dates for about $2.25 each. NOTE: The prices listed above are for coins in EF (extra fine) condition. If you have one of these uncommon varieties, I suggest that you have it graded by a 3rd party grading service, such as NGC to better determine the value of your coin. If your coin is a lower grade, it will be worth considerably less, and if it’s a higher grade it could be worth considerably more. You could also have a local coin dealer give you an idea. 1934 Double Die – IN GOD WE TRUST looks doubled $75 to $225. See what the more expensive 1932 D quarter looks like. That about wraps it up for info you need to know about Washington quarters. Hopefully you’ve enjoyed reading the history behind the coin and maybe you have a quarter that’s worth more than 25 cents! TIP: If you have a collection of Washington quarters, then you’ll want to organize them in Washington quarter folders for safe storage. I have been collecting and trading coins for years. Coin collecting is a hobby for me, and I’ve done a lot of research about coins through the years. Stay up to date with what's happening on The U.S. Coin Guide. From finding Rare Coins to determining Coin Values and other Fun Things To Do With Coins... you'll always be the first to see these helpful tips as soon as we publish a new article.